How to Choose the Best Child Care Center for You! 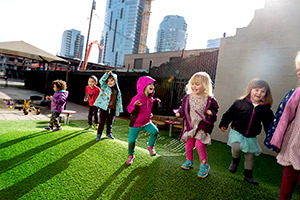 As child care experts who’ve been at it for 50 years, we know the hunt for the best learning center for your child can be a little stressful—daunting, even. We’ve got you covered. This simple, six-step checklist for families with children ages 1 to 4 will help you understand what a “high-quality” preschool program looks like—and yes, a great early childhood education counts! Consider this: Children who attend KinderCare Learning Centers are ahead of their peers in math and reading when they enter kindergarten. We’re proud of that! Looking for more information to aid you in your search? Read the full version of our guide. Good luck, and we hope to meet your family soon! Before a tour, make a list about what you need, what you want for your child, and any concerns you may have, no matter how large or small. No matter what comes up, it’s valid! Use your list as a conversation guide on your tours: Do you want your child to be super-duper ready for kindergarten? Are you concerned how a teacher will handle your spirited child if they knock down other kids’ block towers? If a center can’t get the basics right, give yourself permission to move on. 1. Cleanliness: The center should (obviously) be clean and tidy. 2. Safety: A strong emergency plan—and the ability to explain it in detail—is a must. 3. Nutrition: Whole grains, fruits and veggies, and no juice or sugary snacks are key. Invite exploration by providing easy access to many learning possibilities— science stations, art supplies, dress-up clothes, and games. Encourage reading by placing books within easy reach and labeling objects to boost early literacy. Build a sense of belonging by hanging art at eye-level and labeling cubbies with names and pictures. If children love their teacher, they’ll love school—and learning. (Parenting wins!) Observe teachers with the children. Are the children engaged? Do the teachers seem to love what they do? Ask them what they love about teaching or, if you have a concern about your child, bring it up. Their answers will tell you a lot about their passions and their openness to working with you! Step #6. Trust Your Instincts. You Know Your Family Best! Did you feel listened to and understood? Was the center warm and welcoming? If you’re unsure, go back for a second visit. A great center will be more than happy to honor your request and make the experience all about you and YOUR family! We provide custom family care solutions for businesses nationwide, helping employers attract and retain top talent and giving employees peace of mind that their loved ones are in good hands while they are at work.